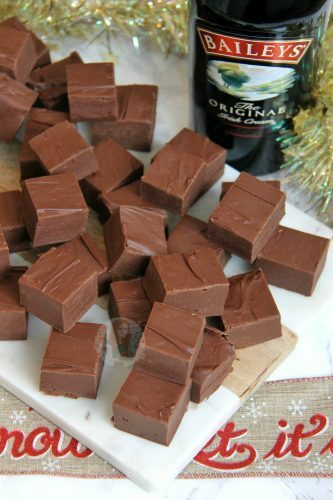 Easy Four Ingredient Baileys Fudge – perfect for Christmas! 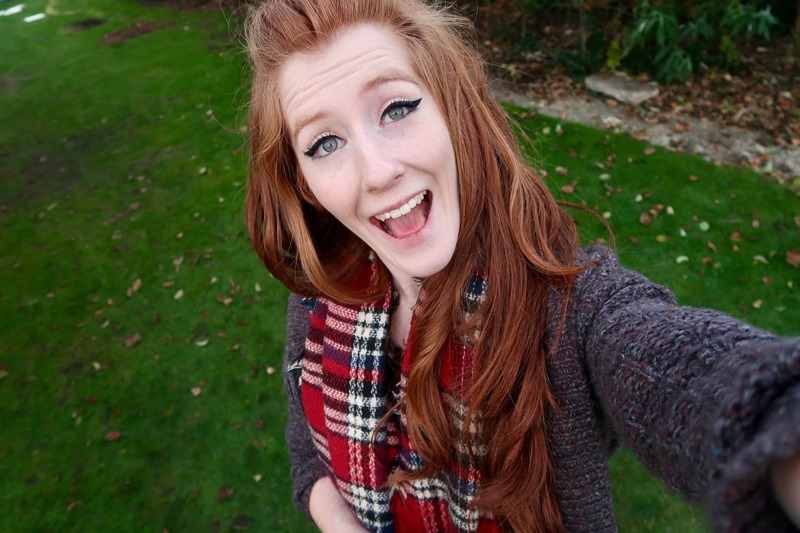 So its officially ONE WEEK TILL CHRISTMAS! Like I am buzzing. Honestly, I am far too excited. I’m moving into my new house today, so I thought something like a delicious recipe would be the perfect thing to have, but to be honest… it was eaten ages ago. However, I’ve made several batches since, and there is some in my fridge waiting to go to the new house for Christmas. Honestly, I wonder why I haven’t shared this sooner. 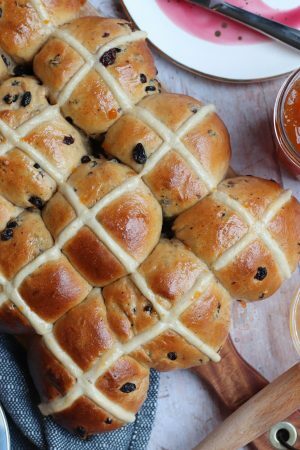 There have been oodles and oodles of requests for this recipe for SO LONG but I thought as a last minute Christmas idea, it would be perfect. It’s something that takes minutes to make, and then a few hours to set, but it means you can make it ahead so easily. It’s one of those things that you can munch on if you’re craving something sweet, or put it out on the dessert table, or give to people as presents. 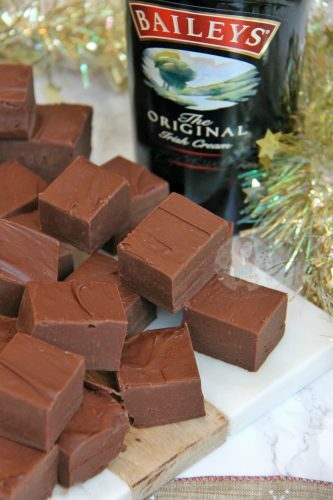 I used slightly more chocolate in this recipe in comparison to most of my fudge recipes, but thats because of the added liquid of the Baileys. I used quite a lot of baileys, so it kinda needs it to set perfectly, but its worth it. I used a mixture of Dark and Milk Chocolate like in my Malteser Fudge and Mint Aero Fudge, but you can as per usual, use all Dark or all Milk. I know Baileys is always a hit around Christmas as my No-Bake Baileys Cheesecake and Baileys Cupcakes recipes for example go a little crazy, and even my Baileys Cake which I didn’t post that long ago has down well! I simply adore it. 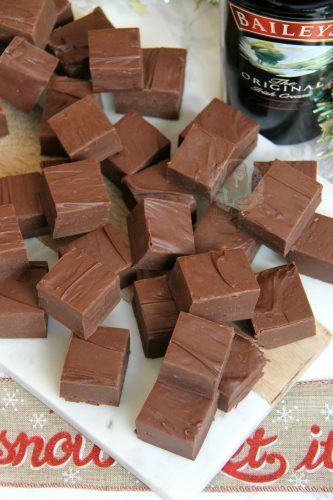 One thing a lot of people said at my work was that they’re not massive baileys fans, but they still liked this fudge. I’m not sure why, but something about Baileys being in fudge made it acceptable and delicious, so I was super happy with that! Easy Five Ingredient Baileys Fudge – perfect for Christmas! Put the Dark Chocolate, Milk Chocolate, and Condensed Milk into a heavy based saucepan – melt on a low heat, stiring often so that the chocolate doesn’t catch on the bottom and burn and so that all the ingredients mix together well. Or melt the two chocolates together carefully in the microwave/double boiler, and then add in the Condensed Milk and mix well till smooth. Once melted, tip in the baileys and combine well with a bit of beating. Add in the icing sugar and combine well again, it might take a bit of beating, but its worth it! Pour into the tin and smooth over the mixture. Store in the fridge for at least 5-6 hours (Or preferably overnight) to set! I used the regular baileys, but you could use the Chocolate Baileys, Salted Caramel, Pumpkin Spice flavours etc, or any other Irish liqueur! I wouldn't recommend using all milk chocolate, but all dark is fine. 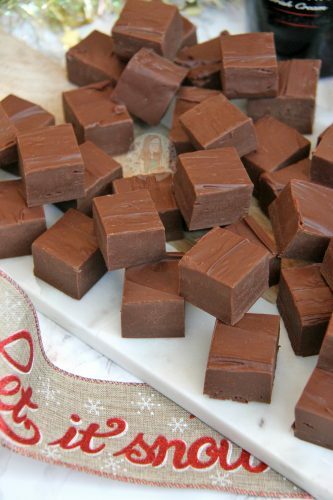 If your fudge is still a bit squishy, its probably got too hot. Chuck it in the freezer to finish setting and it'll be dandy! 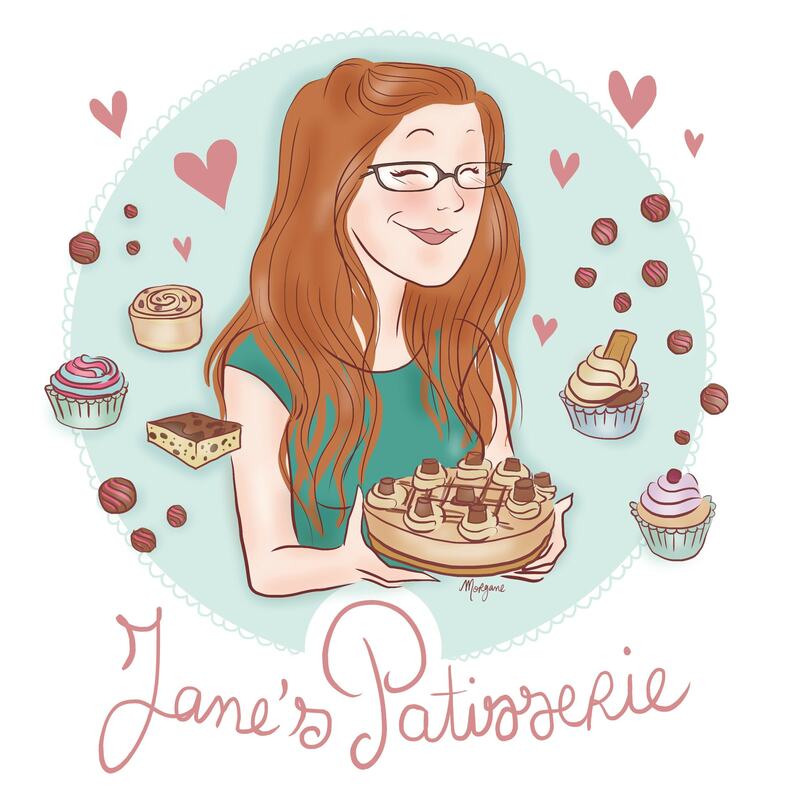 Find my other Sweets and Christmas Recipes on my Recipes Page! 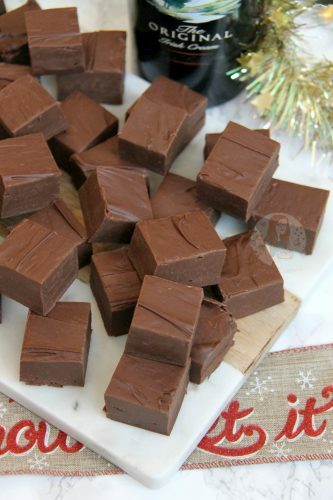 Older Next post: Christmas Rocky Road! Newer Previous post: My Top 10 Recipes in 2017! Can you use evaporated milk ans not condensed? Do you have to heat the recipe to a certain heat? 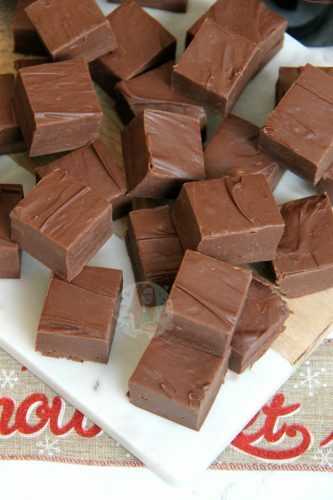 No, just enough to melt it – it’s condensed milk fudge so it’s not a boil with a thermometer type! 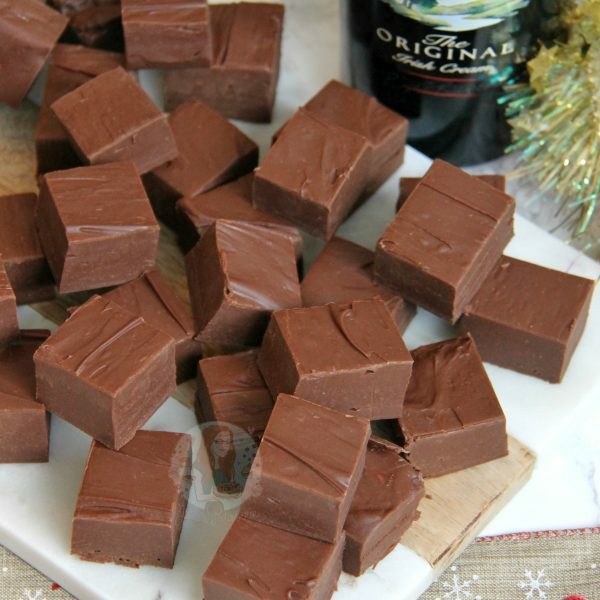 Love your recipes have recently made the Terry’s choc orange fudge and was a massive hit. 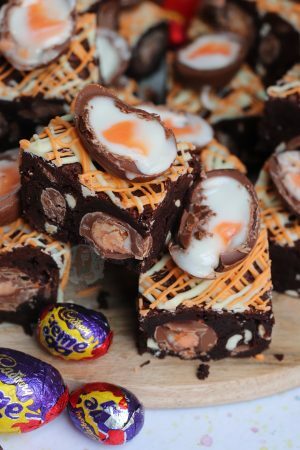 Do you think this recipe would work with white choc? Probably for this one, no. Due to the added liquid, you would probably need nearer 1kg of white chocolate to get a solid set! It might be that it got a smidge too hot. Did you use the right quantities of dark and milk? If you use a chocolate such as cadburys it can make it a lil’ soft, or just milk, for example, can make it softer as well. Chuck it in the freezer for a bit and it’ll be fine! We have just made this and it is delicious, not too much Bailey. Great fun licking the saucepan out! Thanks, Jane! I have just finished making a batch, threw some lovely Christmassy sprinkles on top, and it is now in the fridge to set. I just wanted to pop a comment on for other people trying the recipe. I found that towards the middle of melting the chocolate and condensed milk, the mixture seemed to split. Not wanting to throw away such a lot of chocolate I continued to melt together and with a bit of time it all came back together smooth as silk! So if anybody else finds themselves in a similar situation, just give it a few more minutes and it will be fine. 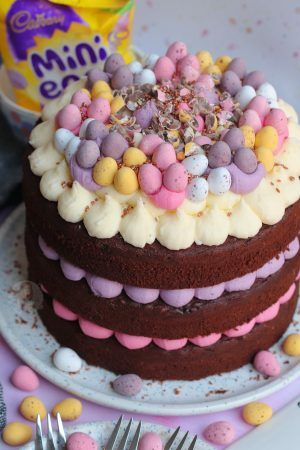 Not sure if it was because I used cheap chocolate (I used Aldi’s 30p blocks), but didn’t want anybody to rush to throw the mixture away if it splits! I love mixing milk and dark chocolate too. I find it gives the best of both worlds – the softness and smoothness of the milk chocolate with the strong chocolate flavour from the dark.